In May 2011, in the middle of a dining room in a rat-infested co-op, Claire and Trisha banded together to satisfy what they thought was missing in their immediate literary neighborhood: a publication filled with wholesome recipes, gut-churning reads, and high-fiber illustrations to get you through the day. They decided to name it—after dipping their spoons into all the bulk bins in the pantry—Oatmeal Magazine. That was four years ago this month, and so on this very special occasion we would like to announce that we are engaged… to you! 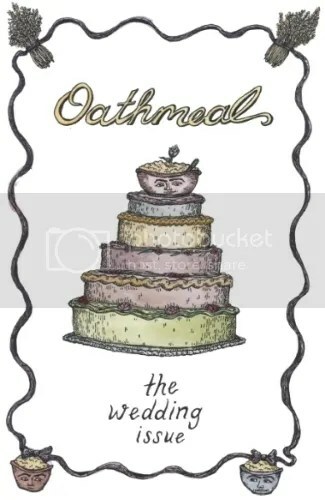 In our most audacious move yet, we’re getting down on our knees and asking you to submit your poetry, fiction, nonfiction, recipes, and literary what-have-you’s to Oatmeal Magazine’s 9th issue, OATHMEAL: The Wedding Issue. This issue is about oaths, promises, and marriages, both real and fake. We’re thinking madcap adventures at Girl Scout camp; complicated pinky promises with compulsive liars, best friends, or both; the time you guys eloped to get better financial aid; yes, all of that, and more. We are looking for tales funny enough to make us rip our trousers in giddy amusement and poems that’ll stir us to raise our thrice-filled glasses of cheap-o champagne to the sky in a big, teary, empathetic toast. We are here for you, for better and for worse, in sickness and in health, ‘til technology-geddon do us part, but even then if that happens not for very long, because we’ve now moved to print issues, so. Enough with this blather already, we’ll get to the heart of it, which is is all to say: we oat you! And we want you to send us anything and everything you’ve been writing. Our submission deadline is July 9th, and our print release party (read: wedding) is on July 24th at E.M. Wolfman (details TBA). Although it may seem like a shotgun arrangement, we are, as always, doing it ginormously, so save the date! Posted in Uncategorized | Comments Off on July 9th Call for Submissions for OATHMEAL: The Wedding Issue!